miBass is a bass guitar-like instrument that can be played on an iphone. 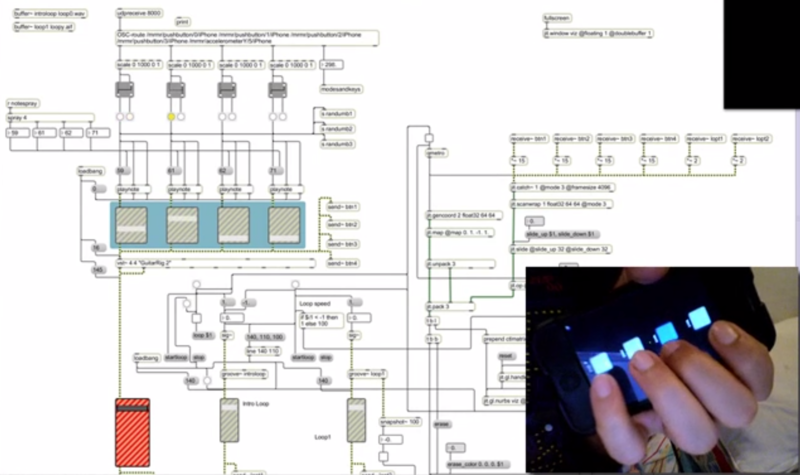 Mrmr on the iphone is used to communicate with Max/MSP/Jitter via UDP messages. These messages are interpreted and converted to preset musical notes that are then driven through Native Instruments Guitar Rig, as a VST Instrument, to achieve the bass tone. There are 8 notes in all, 2 groups of 4, which can be switched by rotating the iphone up and down. The visuals are created using Jitter nurbs (jit.gl.nurbs) which get modified based on the levels of the tone produced.